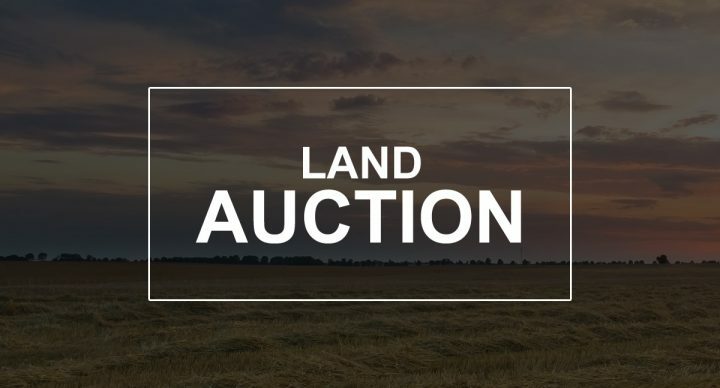 We will offer the following real property at auction at the land located at 47527 231st St., Flandreau, SD; from Flandreau, SD – 7 miles west on Hwy. #32 and 1 mile south on 473rd Ave. to the NE Corner of the Land; from the Flandreau, SD Exit #114 on I-29 – ½ mile east and 1 mile south on 473rd Ave. This +/-156.28 acre farm will be offered as a unit. The farmstead includes a one and 1½ story home with the main level comprised of a south entryway w/laundry and a stairwell to the basement, a kitchen w/oak cabinets, a living/dining room, a bedroom w/closet, a bath w/4’ shower and an east entryway; the 2nd story includes a W. bedroom w/walk-in closet, a SW bedroom w/freestanding closing, a SE bedroom w/freestanding closet and a small east bedroom w/closet; this home has a basement with a concrete foundation and includes a roughed-in shower and a ½ bath w/stool & hand sink, a Lennox Pulse 21 LP gas furnace w/woodburning stove attached, a gas HW heater, a 100 amp breaker elec. service and a water pressure system that is utilized in connection with the well; the exterior of the home has white vinyl siding and asphalt shingles. **Note – The LP tank servicing the house is leased from Ramsdell F&M & is not included with the property – remaining gas in the tank will be estimated and paid for by the purchaser at closing. ** Other improvements on the property include an unattached dbl. garage w/2 overhead doors & 1 elec. opener, an “A” shaped barn w/galv. steel roof, a wooden granary/corn crib w/drive thru, a wdn. hog house, a wood framed chicken house w/conc. floor and an older wdn. single garage. This property is serviced by a well with a pressure system, although the nearest rural water lines are at the Jct. of 473rd Ave. & 231st St. – for info. concerning availability & costs, contact Big Sioux Community Rural Water at 605-997-2098. Electricity to the farmstead is provided by Sioux Valley Energy Rural Electric. The farmstead is situated in a semi-private setting at the end of a dead end road with numerous mature trees and a dense grove situated on the north and west of the farmstead, with the property bordered on the north by 231st Street and on the west by I-29. According to FSA information this farm has approximately 97.7 acres of cropland with a 48.91 acre corn base with a 156 bu. PLC yield and a 30.69 acre soybean base with a 37 bu. PLC yield; additionally this farm has approximately 34.3 acres enrolled in a Marginal Pastureland/CRP contract at a rate of $74.40 per acre that generates an annual payment of $2,552.00 per year with the contract scheduled to expire on Sept. 30, 2021. According to the Moody County Assessor this land has an Overall Soil Rating (OSR) of .792, comparatively info. obtained from Surety Agri-Data, Inc. indicates that this parcel in its entirety has an Overall Weighted Productivity Index of a 70.7. The 2018 RE Taxes payable in 2019 on this property are 4,562.98. Crop-Livestock farms such as this one are difficult to find, so if you’re in the market for a desirable crop-livestock farm, then be sure to inspect this property and make plans to be in attendance at this auction! LEGAL DESC. : The NE ¼, exc. Lot H-2, of Sec. 31, T. 107., R. 49W., (Clare Twp. ), Moody Co., SD. TERMS: Cash – A 10% non-refundable downpayment on the day of the sale and the balance on or before April 5, 2019 w/full possession of the cropland & pasture for the 2019 crop year subject to the rights of the existing tenant. Marketable Title will be conveyed and a Title Company Closing Fee (Moody County Title) if any, and an owner’s title insurance policy will be provided w/the costs divided 50-50 between the buyer and seller. The acres in this farm are based on the acres as stated on the County tax records, with the acres understood to be “more or less”. The sellers do not guarantee that existing fences lie on the true and correct boundary and any new fencing, if any, will be the responsibility of the purchaser(s) pursuant to SD Law. FSA yields, bases, payments & other information are estimated and not guaranteed and are subject to County Committee Approval. Information contained herein is deemed to be correct but is not guaranteed. This property is sold in “AS IS” CONDITION and subject to any existing easements, restrictions, reservations or highways of record if any, as well as any or all Moody Co. SD Zoning Ordinances. The RE licensees in this transaction are acting as agents for the sellers. Sold subject to confirmation of the Owners. To Inspect the Property or for addt’l info., contact the Auctioneers.